Last week I had the pleasure and honor of traveling to Ecuador. The trip was organized by Ecole Chocolat. We had a group consisting of: Gallo, our driver; Daniel, our guide (both are native Ecuadorians); Jeff of Stern’s Confections in Quito; Steve of Devries Chocolate; Paul and James our Scotsman from Cocoa Mountain; Yurin and Yun from South Korea who do bean-to-bar at their shop; Chocolat & Objet; Justin who works for an environmental NGO from Amsterdam; Carla a professor of Anthropology at Harvard; and Isaac, my general manager, and myself. 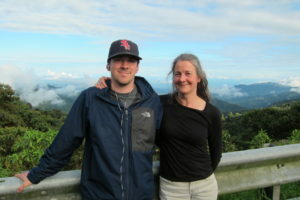 The trip began in Guayaquil, then we traversed across the country from the lowlands of Costa Pacifica to the Highlands over the Andes at Quito, to the jungles of Amazonia. The purpose was to visit cacao farmers in Ecuador who grow some of the finest flavored cacao of the Nacional or Arriba variety. In 2011 Ecuador surpassed production of 130,000 metric tons annually. 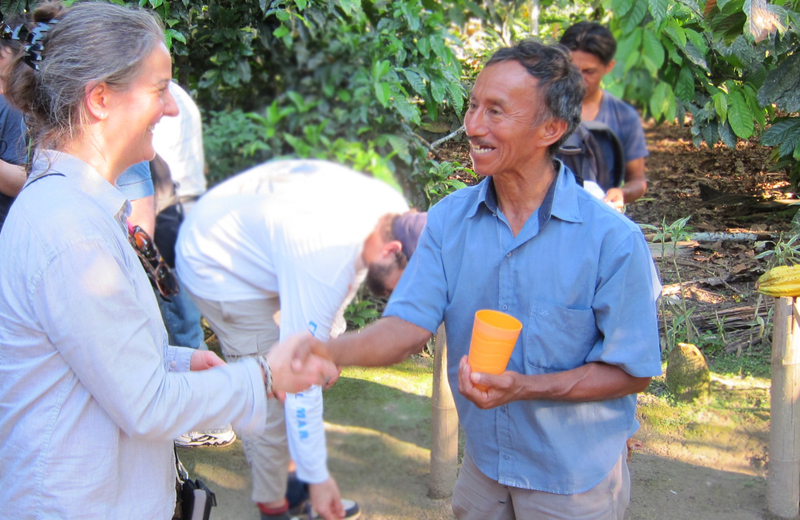 One of our first stops was a farmer in the Los Rios area, Samuel Von Ruut, a Swiss man that had worked for Nestle 30 years ago, he then fell in love with Ecuador and has stayed on to farm some very fine flavor cacao. He and his wife hosted us for an afternoon, showing us his fermenting and drying techniques, we had a great lunch prepared by his wife and then walked the fields. After the farm, we visited a few collection centers and a farmers’ cooperative in order to understand the commercial chain for cacao in Quevedo, Limon, La Mana, and El Empalme. The following day we made a stop at INIAP, Institute for National Autonomous Agricultural Research. This is a research agency that is developing Nacional clones for distribution to farmers. They also test beans for their genetics to ensure Ecuador will continue to produce the Nacional variety of cacao. From the lowland areas we drove north to the town of Mindo in the foothills of the Andes. Mindo is enchanting, it is an area known for it’s ecotourism we all wished we had more time there. Mindo is the home of Mindo Chocolates owned by Jose Meza and Barbara Wilson from Dexter, Michigan. They fell in love also with Ecuador and began making chocolate with beans from a local cooperative. They pay above fair trade wages for their cacao which they also ship to Michigan where they have another small factory in the US. After too short a visit in Mindo we travel to Quito the capital which is in a high river basin 9,350 feet (2,800 meters above sea level), to the east is Pichincha an active volcano of the Andes. In Quito we visit Ecuatoriana Chocolate Factory. 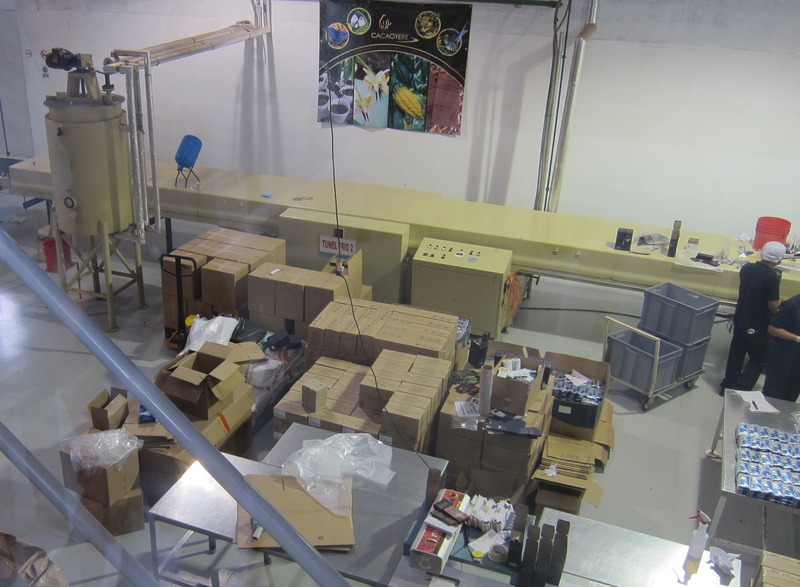 They do bean to bar processing there as well as packaging for others’ private labels. We then begin our travels into Amazonia. Our first stop along the way is for a soak in thermal pools. If you’ve never experienced this pleasure, take note next time you travel and take a pause to relax and enjoy the hot springs when ever you find them. Back in the bus we go and soon we are at an incredible vista looking into the Amazon Basin. The whole drive this day is spectacular, we travel through many ecosystems all more scenic than the next. As we approach nightfall, (which is 6:00pm, because we are on the equator the days have equal length all the time! sunrise 6:00 am sunset 6:00 pm) we find our lodge on the end of a gravel road nestled into the jungle. I have to admit I am a fit freaked out when I am shown to my bungalow which is #1 and on the end of the grouping of bungalows, I feel isolated and scared in the complete darkness surrounded by very noisy tree frogs. What to do but put on my big girl underpants and deal with it, heck I’m in paradise. Morning comes and wasn’t attacked in the night by wild animals and I breath a bit easier. This is my favorite day. We drive to Tena and visit the Kallari Cooperative. In November the day before Thanksgiving, Roberto, a farmer from Kallari and Judy who has ties to Spring Green, WI pay me a visit in my shop. They tell me about the Cooperative and we taste their chocolate which is organic and fair trade, I order 500 lbs. on the spot, I like it so much. Before Roberto has a chance to invite me to visit, I ask if I can come meet the other farmers and see the cooperative. He beams at my interest, we all feel like we won the lottery. First stop is the office of the Cooperative where they present to us a slideshow on their goals and the work being done to help the 850 families in 21 communities that belong to the Cooperative. One of their objectives is to share ancestral knowledge which includes crop rotation, working with handicrafts and all generally referred to as “chakra” or family garden plot. Being from Madison and a crazy gardener and farmer’s daughter, I was digging this. Kallari stands for conservation and cultural rescue, a pretty nobel cause if you ask me. They are not only producing fine flavored cacao but tea, furniture (from the trees they grow), soaps, essential oils, and fibers. In Tena they have a processing center for the cacao. They go to the farmers to pick up wet beans (after opening the pods, the beans are removed which are covered in a white slimy pulp, but oh so tasty) and bring them back to the center for fermentation, drying, sorting and bagging for sale. We then drive to visit a farmer who lives on a small island in a river. On the way we stop at the Kallari’s future factory for processing the beans into chocolate. The factory will have a dry room for storage of beans, dirty room where they sanitize and clean the beans, winnower, grinder, roaster, conche and packaging areas. Also included would be offices, a cold room for storage of chocolate, reception, and a restaurant upstairs, by 2014 they hope to complete the project. Behind the factory they are also building a bio-knowledge building which will explore other local items they could manufacture or sell with value added. The dream is to have a weekly farmers market in front with lodge in back. The location is central to the farmers. Next stop is the river’s edge to hop on a flat bottom boat and cruise down the river to Ceasar’s paradise island. There, Ceasar proudly welcomes us and tells us about many of the other trees growing there and their uses before we even get to the cacao. He and his wife then take us through their farm and demonstrate how they harvest cacao and manioc which is a staple of their diet. We end our visit with a toast of chicha a local drink. I thank Ceasar when we leave for growing such incredible cacao, and tell him I use Kallari chocolate in my shop in Madison, he then takes my hand again pulls me in for a hug and a kiss, he is beaming with pride, this is why I travel to farms!